Kelowna, nestled in the crook of Lake Okanagan, is the epicenter of the Okanagan Valley and a cosmopolitan blend of art, culture, history and dazzling scenery. 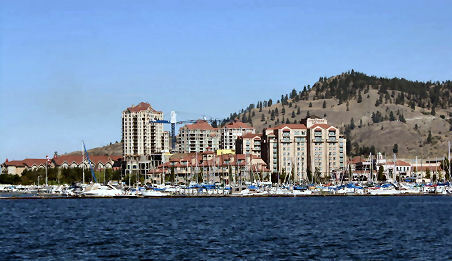 With a population of close to 110,000, it is the largest city of the Thompson Okanagan region and a magnet for tourism. Surrounded by dozens of wineries and fruit groves, it sits amid picture book scenery, a short drive from many of the area's recreational activities, as well as the nearby cities of Penticton, Osoyoos, Summerland and Vernon. Wine festivals are among its seasonal specialties, with dinners, wine tasting and other activities scheduled throughout the Kelowna area. Not surprisingly, most people come to Kelowna to experience its warm, arid summers. Lake Okanagan offers a myriad of recreational opportunities, from water-skiing to renting a houseboat. Miles of parks and trails surround the city, providing ample opportunities for hiking, biking, horseback riding and a wealth of winter activities. There are a number of ski resorts within easy driving distance from Kelowna, including Apex, Big White and Sun Peaks. There are also numerous small tour operators that offer everything from backcountry snowmobile tours to heliskiing trips for the ardent adventurer. After-hour activities include fine dining, musical entertainment and seasonal picks such as the Okanagan Film Festival. Showcasing award-winning Canadian films, the festival is a yearly tradition and has added to Kelowna's growing reputation as a cultural center of British Columbia.